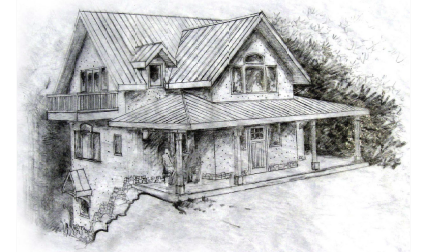 After almost 3 years of delay (due to the recession and financing issues) we are back on track to begin building our new strawbale home in the summer of 2012. It’s going to be beautiful, and we’re excited! As you can see from this rendering, it will have a Mediterranean look with simple lines, large roof overhangs and awnings over the windows. It will be about 2200 sq. ft., with 3 floors, 2 baths, 3 bedrooms and lots of window seats. Both floors & the basement will be connected via spiral staircase, and every room will have natural light. Check back soon for pictures of the site it will be on, which overlooks a creek in 27 acres of woods. VOLUNTEERS: thanks for stopping by. Please check back for details on how to sign up after June 1. If you just can’t wait, send an e-mail to Help@ChenowethEast.com for further information.